(a) Calculate the minimum frequency of ultrasound that will allow you to see details as small as 0.250 mm in human tissue. (b) What is the effective depth to which this sound is effective as a diagnostic probe? This is College Physics Answers with Shaun Dychko. The spatial resolution of a wave is approximately equal to its wavelength. And so, we know what the speed of ultrasound is in tissue, and we know what resolution we want, which is 0.25 millimeters. And so, we'll solve this for F to figure out what frequency of ultrasound is needed. So, we'll divide both sides by lambda. So F is speed divided by lambda, so that's 1540 meters per second, speed of ultrasound in human tissue, divided by 0.25 millimeters written in meters as 0.25 times ten to the minus three meters. This means the frequency must me about 6.16 megahertz. This is 6.16 times ten to the six hertz. 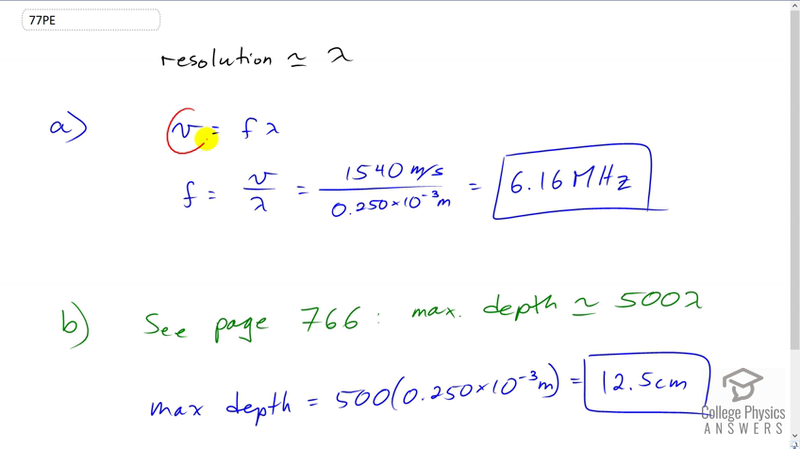 And, the next part of the question asks us to what maximum depth could this wavelength be used. And on page 766, there's a bit of a rule of thumb that says that says the maximum depth is about 500 times the wavelength. And so, that's 500 times 0.25 times ten to the minus three meters, which is a maximum probing depth of about 12 and a half centimeters.